Make sure to visit the user personalisation settings to set up your profile. Other than the obvious (classpect, Dream moon, etc. 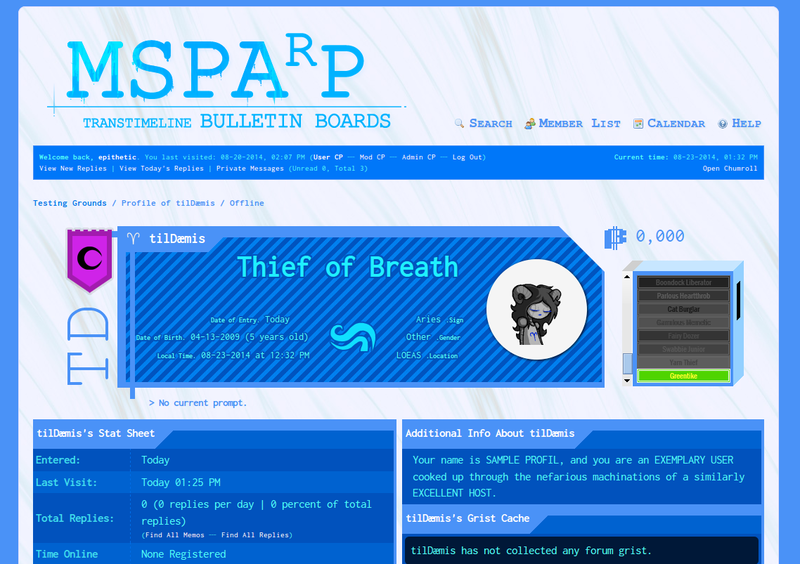 ), you can also customise how the boards should be rendered (including choice in font and margin width). Your settings will determine the layout of your profile and your echeladder, and reflect in replies across the boards. For optimal results, your avatar should be a .gif or .png file with a transparent background (e.g. talksprite style). 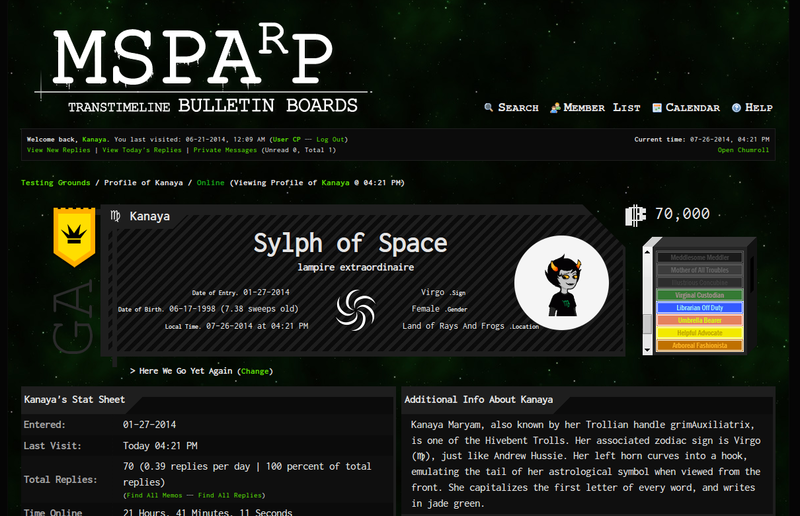 Setting your class and aspect will not only personalise your profile in terms of appearance, but also the rungs of your echeladder (echeladder rungs/boondollars are earned by posting in the forums). Your profile also displays your accumulated grist cache. 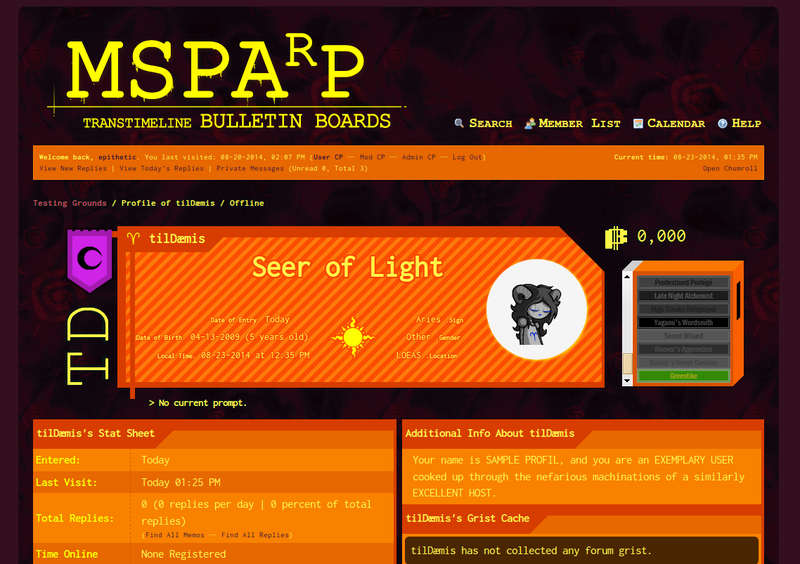 Forum grist is independent from echeladder rank and can be earned through participating on the boards in a variety of vaguely specific ways. What ways you ask? NANNASPRITE: I'm afraid my lips are sealed about that, dear! Hoo hoo! If your profile is starting to look cluttered, or you simply want to hide away your pRecIOUS, you can choose which grist types to display on your profile from your Grist cache settings in your User CP.